A French art dealer, who has not been identified by police, filed a theft report after forgetting the picture in the cab's boot on Thursday. He reportedly became distracted by a call on his mobile and only noticed he no longer had the picture the next day. 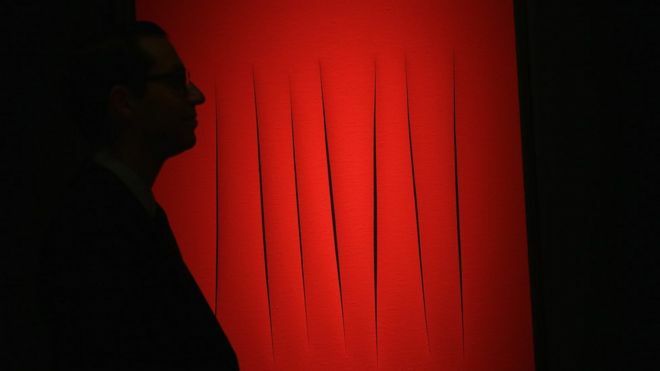 The work is Concetto Spaziale (Spatial concept) by Argentina-born Italian artist Lucio Fontana, who died in 1968. The dealer had been making his way to a modern art gallery in Paris's third arrondissement. He tried to locate the taxi he had used but was unsuccessful and on Saturday went to police, Le Parisien newspaper reported. But the driver returned the work on Tuesday, AFP news agency quoted police as saying. Fontana's picture is one of a series of abstracts he made featuring the piercing of the canvas to create an actual dimension of space and using light. The artist became known for founding the spacialist movement, which called for the art world to embrace science and technology, according to the Tate Gallery. An artwork worth €1.5m ($1.6m; £1.25m) has been found after it was accidentally left in a taxi in Paris, BBC reports.